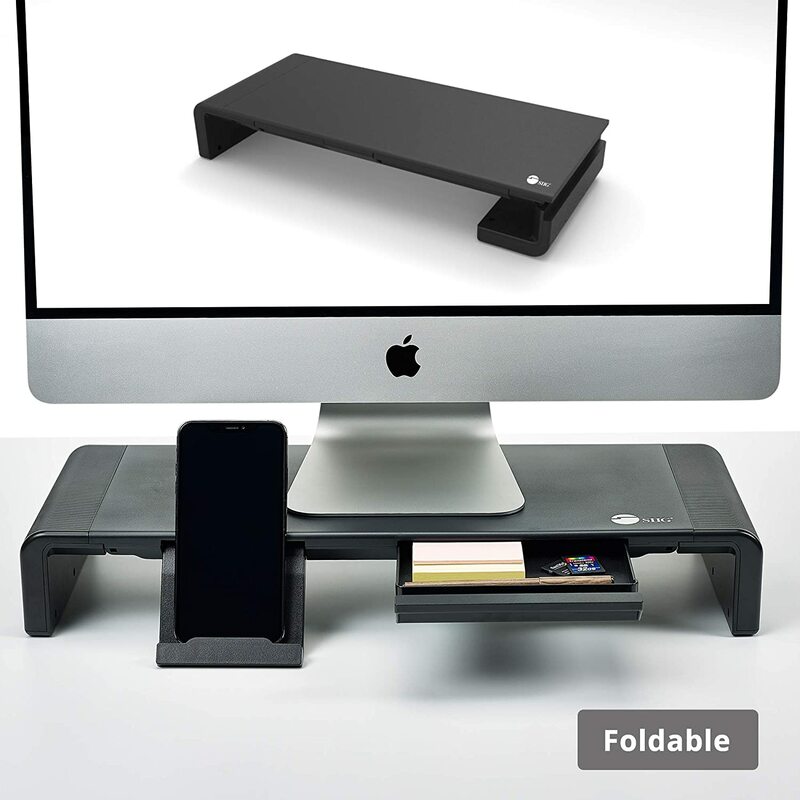 MONITOR STAND: Elevates your laptop, monitor, TV, tablet, mobile phone, printer and raises them to a comfortable angle to provide an ergonomic position. 3 ADJUSTABLE WIDTH: The width adjustable function allows you to expand the stand for bigger/wider devices (Adjustable width: 16.5" / 18.5" / 20.5"). The width flexibility also accomodates to any keyboard size allowing you to store away your desk accessories underneath the stand when not needed to clear up your desk area. .
STURDY AND SCRATCH RESISTANT - Supports load capacity up to 55lbs. Silicon Anti-Slip Pads are incorporated to enhance stability and help protect your work surface from scratches. STORAGE ORGANIZER: Included with built-in mobile phone and tablet stands for you to mount your portable gadgets off the desktop. Store away notepads or pens in the built-in storage tray for convenient usage. PREMIUM CUSTOMER SERVICE - This Desktop Monitor Stand Riser is backed with a TWO YEAR limited warranty and experienced tech support team in Silicon Valley. If you have any questions or concerns, please do not hesitate to contact us and we will get back to you within 24 hours.